The Gunpowder River is flowing at 78 CFS and is 55.5 degrees F. Conditions on the Gunpowder River are improving leading up to the holiday weekend! We’ve had quite a few guide trips this week with people new to the sport. 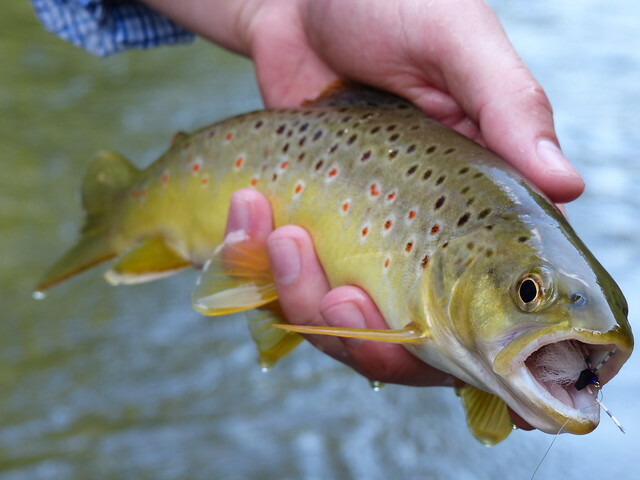 Many have connected on dry flies patterns including Tricos and Olives in the upper catch and release section. For those that would rather see their flies before the fish take them and would rather not fish 7x wild fish will take terrestrials just fine. 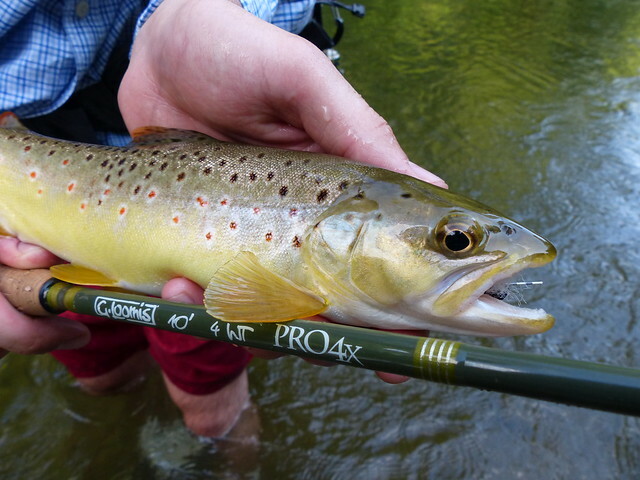 Josh Reider recently caught and released this beautiful wild brown in the two fish day stretch on a foam hi-vis beetle. 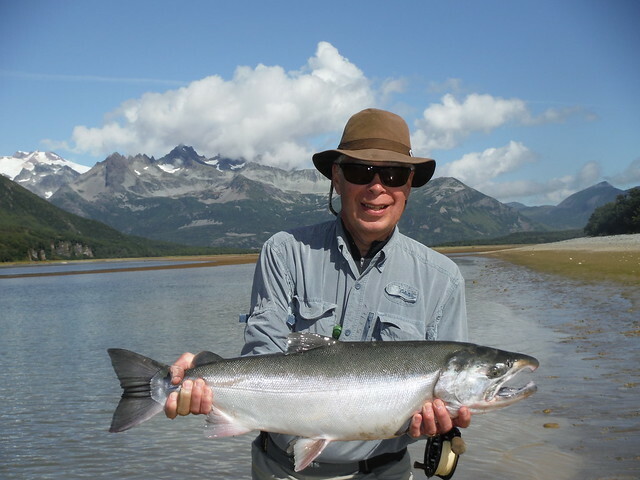 This entry was posted in fishing report on August 29, 2014 by Theaux Le Gardeur. Here’s the biggest of the week, 33” and 20lbs, from the Swishkak River in Katmai National Park, right where river empties into the saltwater. The silvers were big and shiny chrome. And packed up in knee-deep, clear water – just like bonefish in the Bahamas. Sight casting with 8wt (Loomis NRX that you sold me), was a delight. Saw every fish, every chase, every take – and then they’d go deep into the backing every single time! It was a terrific experience! This entry was posted in fishing report, gear, reviews on August 28, 2014 by Theaux Le Gardeur. Since the water level was dropped a few days ago the Gunpowder River is flowing at 36 CFS. Terrestrial season has heated up and many have found some fish on small beetle and ant patterns. One in particular, tied by Eric Snyder, with a black foam and a peacock underbody has been successful when fished near the banks during the afternoon. In the evenings I have seen a few caddis hatching off above the Masemore Road access. A size #16 tan elk haired caddis should do the trick to fool those finicky fish.With rain in the forecast for tomorrow we may see an increase in flows. That will offer good streamer fishing for the next day or too. 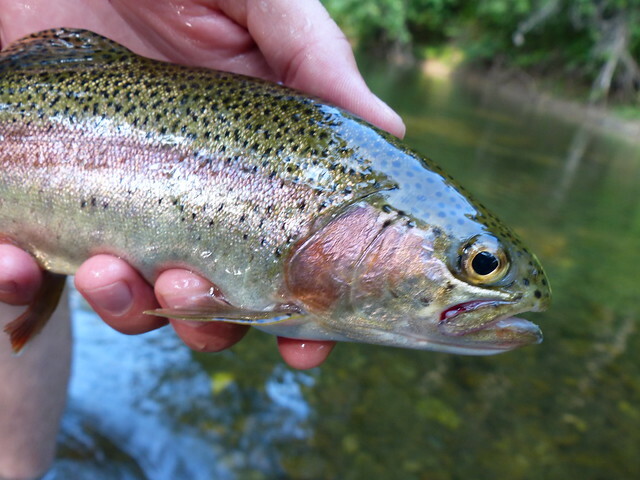 This entry was posted in fishing report on August 15, 2014 by Theaux Le Gardeur.